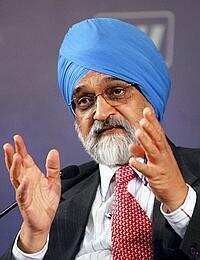 Stronger action: Montek Singh Ahluwalia, deputy chairman of the Planning Commission. In an attempt to combat corruption in various Centre-sponsored programmes and food distribution, the government has appointed two outside agencies even as it specifically addresses ways to deal with the problem in the 11th Plan document. The Planning Commission is of the view that corruption, especially in food distribution to the poor, is still high despite government attempts to plug loopholes over the years. “In the 1980s, Rajiv Gandhi, when he was the prime minister, had said he felt that for every rupee spent on food distribution through the public distribution, only 15 paise reached the poor. Such was the extent of leakage, but today it has come down from 83% to 50%," said deputy chairman of the Planning Commission Montek Singh Ahluwalia. He agreed that even 50% is still too high. A report prepared by the Commission, which was submitted last year, had concluded that leakages in targeted public distribution systems, which aims to supply foodgrains and essential commodities to those below the poverty line, was as high as 50% across the country. “Corruption is widely known, accepted and perceived, and the existing machinery should be made more efficient, besides punitive action should be made stronger," said Ahluwalia. In order to get a fresh perspective on the problem, the food ministry has engaged two independent research agencies, the National Council for Applied Economic Research and the Indian Institute of Public Administration, to study the quantum of leakages in the public distribution system and to suggest ways to tackle them. “These independent agencies are working across 26 states and are doing extensive field studies at block levels. We are expecting to get their report by the beginning of next fiscal," said a food ministry official. The Food Corporation of India (FCI), which procures and stock foodgrains, has recently written to the government that state enforcement agencies involved in such distribution should be strengthened. According to an official, who did not wish to be identified, FCI has written to the food ministry that joint sampling of foodgrains with respective states be done to ensure adequate quality of grain offered through the public distribution system. “FCI has also said that a quality control department and a vigilance official be put up in every state agency and large scale random checking be done at state levels to check diversions," he said. According to R.H. Tahiliani, chairman of Transparency International India, the highest level of corruption is seen in the government’s procurement, whether it be fertilizers or wheat or goods ordered by public sector undertakings.